It’s hard not to laugh at the darkly comic premise to Coffin Dodgers. When the Grim Reaper descends on the tranquil retirement village of Sunny Pines, the unsuspecting elderly residents are woken in the night and warned that their souls will be claimed in three days time. With seven senior citizens arguing that they are far too young to die, they challenge the Grim Reaper to a mobility scooter racing championship to the death to determine who can still live. 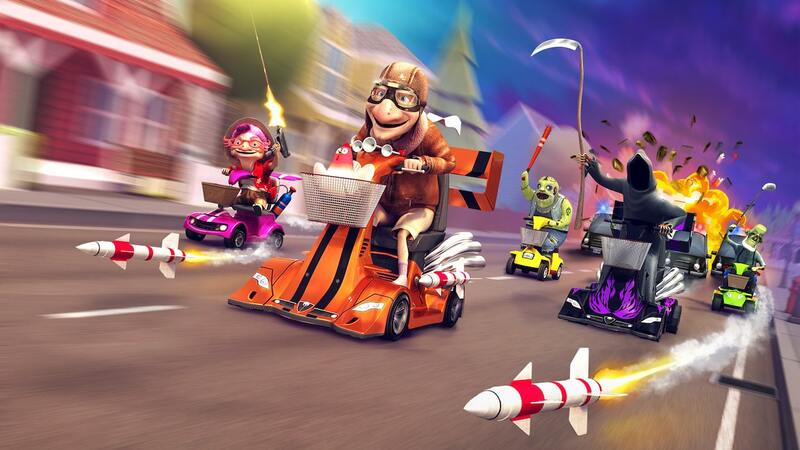 With their mobility scooters modified into battle-hardened racing machines, you, quite literally, race for your life in this quirky take on a kart racing game. After deciding which of the seven retirees that you want to save from death, the game’s main Story mode challenges you to remain in the lead for 13 races or lose their soul to the Grim Reaper forever. extraordinary blues guitar performer Wilbur, former centrefold model for Playman magazine Lucy, or ex-Messerschmitt pilot Rudolf, who have all been given their own backstories to help you choose which to rescue from the Grim Reaper’s clutches. Resident selected, a tutorial will first teach you everything that you need to know to keep in front of your competition and get the most out of your pimped up mobility scooter. The controls for driving will come as no particular surprise, with the Left Stick used for steering, the ZR Button to accelerate, and the ZL Button to brake or reverse. And, while the tracks that you hurtle around are littered with pickups, you can hold down the B Button to whack a rival that you’re clashing bumpers with using a walking stick. The pickups that will lend you a competitive edge are homemade weapons and gadgets, letting you drop cans of oil on the track, light the fuse on homing fireworks, zap nearby competition with a defibrillator, use small jet engines to boost for a few seconds, or even pull out an uzi to riddle your rivals with bullets. It’s a fun assortment but is severely hampered by the fact that there’s nothing that can really help you to catch up if you manage to fall behind. There are 13 tracks to race around, that are grouped into the four different areas that the racing championship takes place, whether that be the village, town, farm, graveyard, or your final showdown with the Grim Reaper. The problem here is that none of them are particularly memorable, aside from for the locations that they are themed on. That’s not helped by the fact that they aren’t named on the menu screen, simply being listed as “Race 1,” “Race 2,” and “Race 3” under the areas that they take place in. This leads us to the fact that Coffin Dodgers doesn’t really have that much content to work through. The Story mode can be beaten in under two hours, leaving you to record your fastest laps in Time Trial or take on up to four players in the usually chaotic local split-screen multiplayer. Competing against friends and family will always entertain far more than taking on the CPU, but there’s not enough differentiation here to maintain your interest beyond a few quick races together. There is an Open World mode that will either challenge you to collect items within a given time limit or simply let you drive around the neighbourhood, but this won’t entertain you for long. It’s a shame, because, while controlling your mobility scooter lacks weight and the game’s presentation is a little plain and basic, there’s plenty of promise behind the concept. That’s most easily seen in The Garage, where you can spend coins won in races on sprucing up your ride. But, whether upgrading your engine to increase your top speed, changing the body shape to improve aerodynamics and grip, or switching out your basket for one that will let you carry more items, this level of customisation is at odds with a game that doesn’t present enough ways to spend your time with it. You won’t lose your soul to Coffin Dodgers, mainly because there’s little reason to linger for long in Sunny Pines. The premise to this race for your soul does more than enough to catch your interest, but the game lacks enough content to keep it alive.